Add a fearsome walker to your LEGO Star Wars First Order army with the Heavy Assault Walker. This awesome model, based on the walker from the blockbuster Star Wars: Episode VIII - The Last Jedi movie, features tough armor-plate detailing, posable legs, posable head with opening mini-figure cockpit and spring-loaded shooters, an aimable rapid-fire stud shooter on top, and detachable canisters that can be released from the rear of the walker. There's also a storage compartment at the side with extra stud ammo and an opening hold to the rear with space for a mini-figure and extra missile ammo. This amazing set also includes 5 mini-figures. 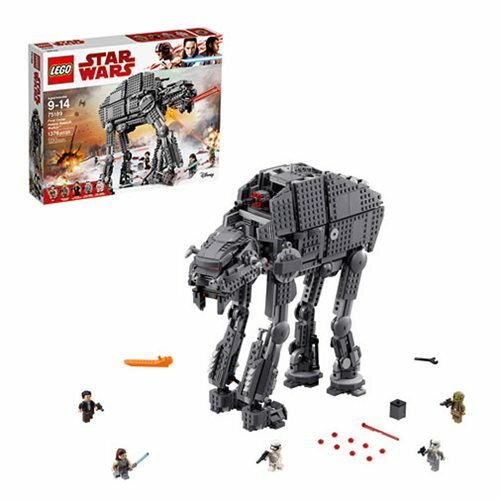 The LEGO Star Wars 75189 First Order Heavy Assault Walker includes 1376 pieces. Ages 9-14. LEGO 70827 The LEGO Movie 2 Ultrakatty & Warrior Lucy!